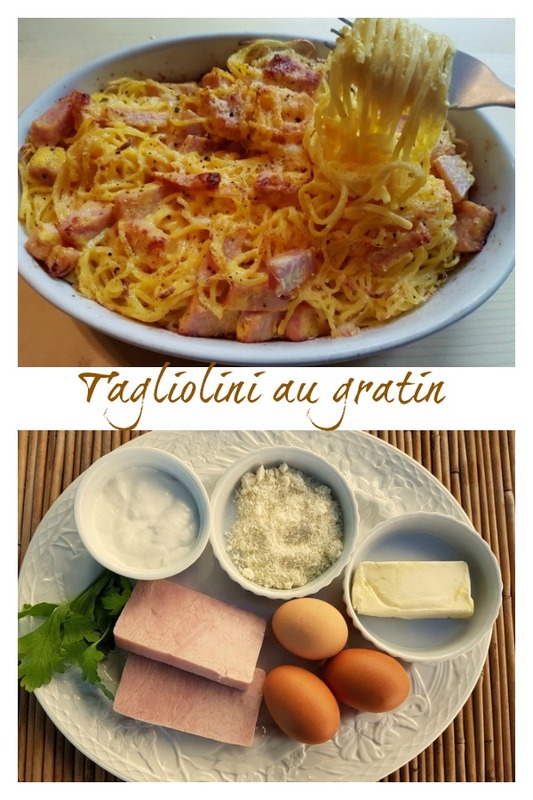 Tagliolini au gratin with ham. Based on a dish from Cipriani’s Harry’s bar in Venice, this tagliolini au gratin recipe is a real gem. 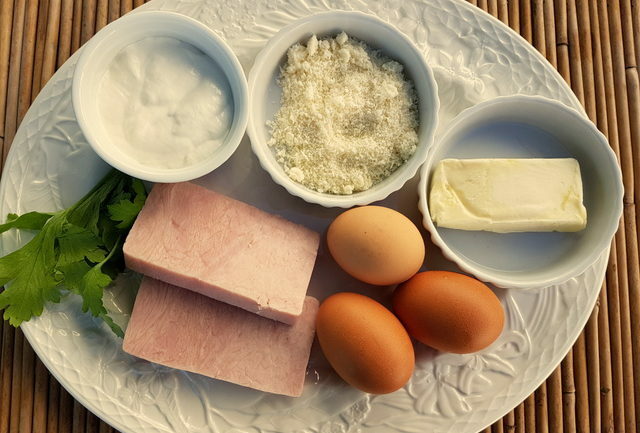 All you need is pasta, eggs, ham, grated Parmesan and cream. 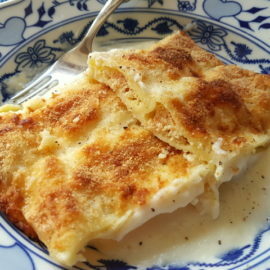 Gratin di tagliolini panna e prosciutto. I’m always on the lookout for easy peasy recipes that can be thrown together at a moment’s notice but are still very tasty and will be loved by everyone! In the world of Italian pasta, there are many! Interestingly, most of these don’t find their way on to restaurant menus or celebrity cook shows. Of those that do, pasta cacio e pepe is one that comes to mind, aglio, olio e pepperoncino is another. The latter is my hubby’s go-to recipe when we’ve got a houseful of unexpected hungry guests! This tagliolini au gratin has just been added to MY go-to list for moments when you need something quick and easy to make! In my opinion, this recipe is an Italian gem. All it takes is some tagliolini or tagliatelle pasta, eggs, cooked ham, grated Parmesan and cream. There is another version of this recipe that includes béchamel and requires cooking the ham for a couple of minutes in butter; a little more work but definitely worth trying out. That recipe is said to have been created at the very famous Cipriani’s Harry’s bar in Venice, Veneto back in the 60’s and is still served in Cipriani restaurants around the world. It was, apparently, one of the favourites of opera singer Maria Callas. 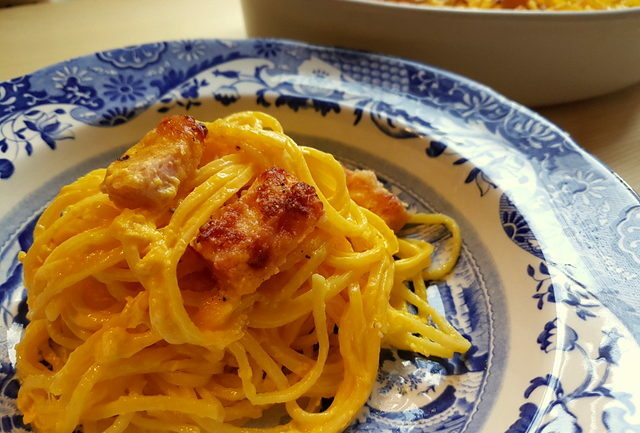 In this much simpler version of tagliolini au gratin with ham, the only cooking required is boiling the pasta and baking the dish in the oven for 10-15 minutes. Can’t get much simpler than that! 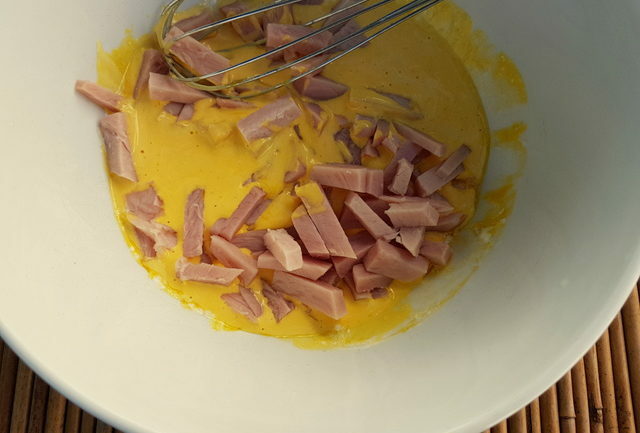 The ham is cut into small strips and mixed with the cream and egg yolks. 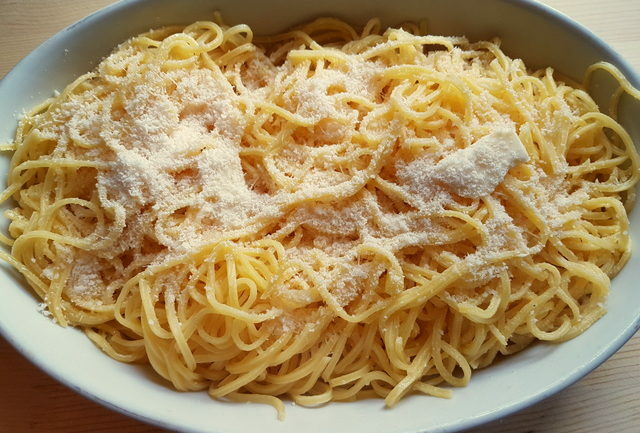 After cooking the pasta al dente mix a little butter and some parmesan into it and put it in a buttered oven dish. Pour the ham and egg mixture over it. Sprinkle with more cheese and your tagliolini au gratin is ready to bake! The result? Delicious! I’m sure, once you have tried it, this recipe will be added to your quick and easy to make go-to list too! 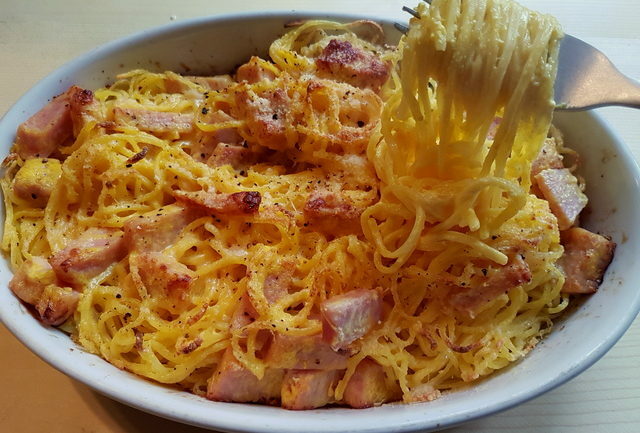 If you make this tagliolini au gratin with ham recipe, I’d love to hear how it turns out. 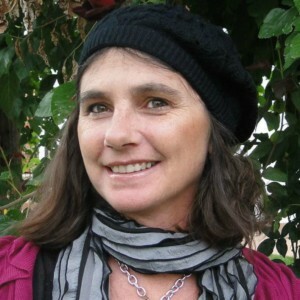 Please write a comment here on the blog, email me or post a comment on the Pasta Project Facebook page. This very simple, easy to make creamy tagliolini pasta au gratin recipe is bound to be a winner with family and friends! Put a pot of water on to boil for the pasta. When it starts to boil, add salt and bring to the boil again. Cut the cooked ham into small pieces. 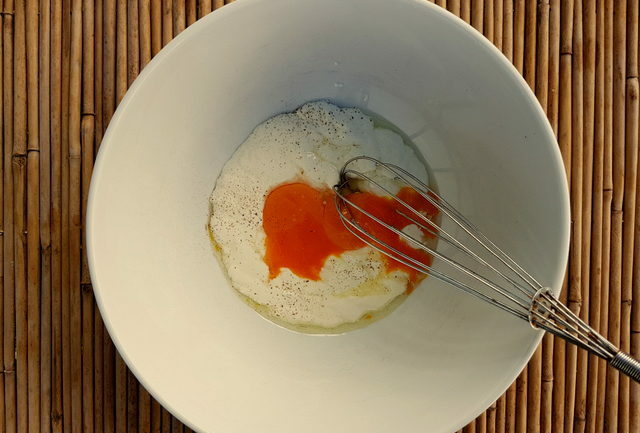 In a bowl, whisk the cream together with the egg yolks, salt and pepper. Add the cooked ham and mix. Cook the pasta al dente in the boiling salted water according to the instructions on the packet. Save a cup of the cooking water when the pasta is almost cooked. Drain the pasta and return it to the pan. Add the butter and most of the grated Parmesan cheese. 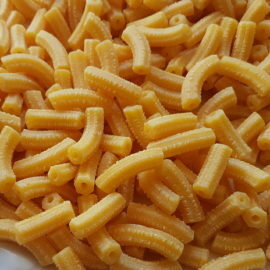 if necessary add a little of the pasta cooking water to get a creamy consistency. Put the pasta into a buttered oven dish. Pour over the cream of ham and mix gently. Sprinkle with a little more grated Parmesan. Bake in a hot 180 ° oven for 10-15 minutes and wait 2-3 minutes before serving the tagliolini au gratin. Serve with a sprinkling of chopped fresh parsley. 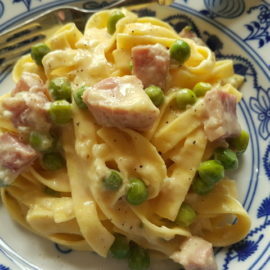 The recipe can be made with tagliatelle too. This sounds amazing. I love the addition of ham in this. So many awesome flavors and loving how easy it is to make! Happy you like this recipe Danielle! Yes the ham really adds flavour. Also a great way to use up leftover ham after Thanksgiving or Christmas! Looks so delicious and perfect for dinner! Thank you Natalie! This is a really delicious way to make a baked pasta dinner. I hope you’ll try it! Oh this looks and sounds marvelous! What a comforting dish to try! Thank you Catherine! Yes this is perfect comfort food and so easy to make too! This is my kind of dinner! Great way to use any leftover ham as well! Glad you like it Kristina! Definitely a great way to use up that leftover ham! Sounds so comforting and hearty – kind of like a baked carbonara. Grazie dear Caroline! 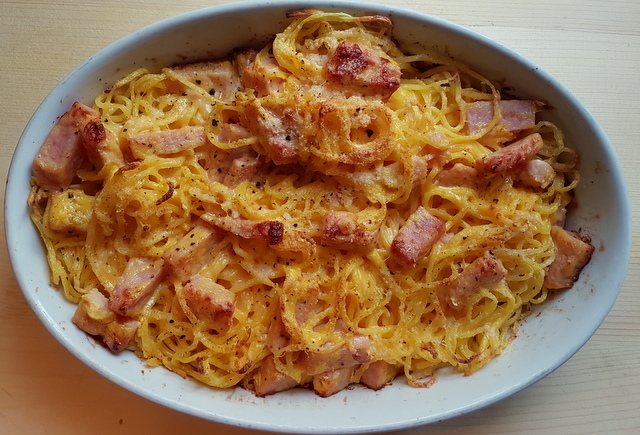 Exactly baked carbonara! I love such amazing things. They are always on my wish list. Sure with the Family. Thank you Veena! Yes this is definitely a recipe to try. I’m sure your kids will love it! I love the simplicity of this dish, simple ingredients and simple instructions -my kind of recipe! This would be a great way to utilize leftover holiday ham! Love this! Thanks so much Krista! This dish is really a winner, simple to make and so delicious!Also a great way to use leftover ham! Such a yummy winter dinner idea! This is on my weekly meal rotation! Thanks Kim! I’m sure you’ll be including this recipe on your weekly meal rotation for some time to come. It’s so yummy and easy to make! I never had anything like this and it will surely be on my lists of must make soon looks terrific! Grazie Claudia! This baked tagliolini is an absolute winner. I’m sure you’ll love it! I think even my very picky oldest son might even like this dish! I can hope at least. looks amazing and makes me hungry. 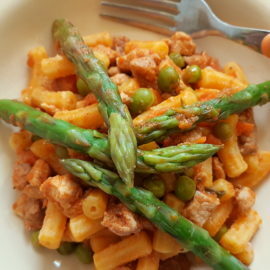 I love such simple and easy dinner recipes especially on really busy evenings after working all day. I love how easy it is to make and how delicious the finished dish looks! I’m all for easy and tasty recipes ! 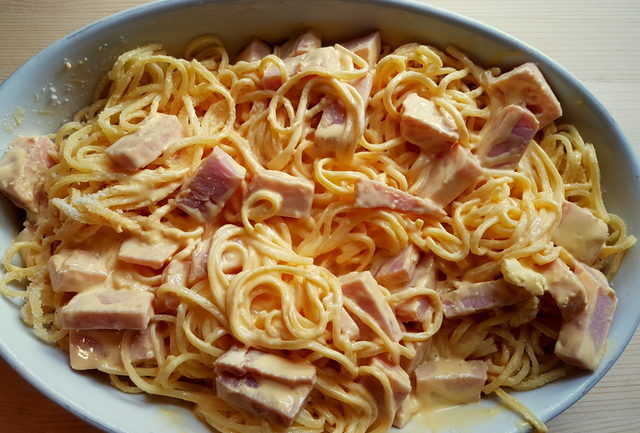 Pasta with Ham and Cheese, just cant wait to relish this amazing dish. Will definitely try it out. Delicious. This recipe is proof that sometimes the simplest dishes are the most delicious. So creamy and comforting!